Supernifty is pleased to announce that version 1.6 of Audio Tuner (Windows) has been released. Price Cut on life time updates to the software! Audio Tuner is a free download – get it or learn more about Audio Tuner. If you have feedback or suggestions for improving Audio Tuner, please contact Supernifty. 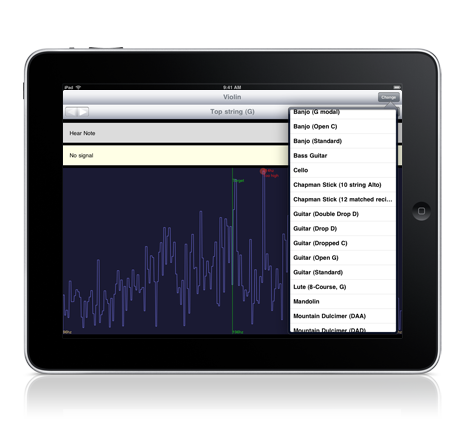 Supernifty is pleased to announce that Audio Tuner is now iPad compatible. Quickly and easily tune just about any musical instrument with your iPad, including your guitar, ukulele, violin, piano, banjo, mandolin… and many more! This new version features a revamped user interface and extra instrument tunings, including tunings for the lute and viola. Read more about Audio Tuner or get in touch if you require further information. Audio Tuner for Android is a mobile application that enables you to tune a wide range of musical instruments, using spectrum analysis and pitch generation. Spectrum Analysis! This is the big one. Play your musical instrument into your Android handset, and it will tell you the pitch that it’s at. More instruments – a number of new instruments, and alternate tunings have been added. Alternate guitar, banjo and ukulele tunings have been added, along with a number of new instruments, such as Viola, Autoharp and Dulcimer. Better power management – this version takes advantage of Android’s power management and backgrounding capabilities to ensure that Android can properly optimize battery life. More accurate tone generation – the app generates tones at the most accurate possible pitch, using the full capabilities of your handset. The list of available instruments now includes the autoharp, banjo, bass guitar, cello, Chapman stick, guitar, mandolin, mountain dulcimer, piano, ukulele, viola and the violin! Phew! To try out Audio Tuner, find it on Android Market. For further information, contact us! Audio Tuner and Audio Tuner mobile. To quickly and easily tune your Banjo to any of the common tunings, check out the latest version of Audio Tuner. All versions of Audio Tuner will be updated with these changes over the coming weeks. To comment on these updates, or to request a particular version be prioritized, please contact us. Note that Audio Tuner is not only available for PC and Mac, but most mobile platforms as well, including iPhone, Android and BlackBerry – keep your Banjo in tune no matter where you are. To learn more, check out Audio Tuner home. Keep your musical instrument in tune with your iPhone. Tunings for many different musical instruments – new ones frequently added. If you’d rather not open iTunes, read more online. If you require further information, or wish to review this product, please contact Supernifty. Supernifty is excited to announce the release of Audio Tuner for the Mac. This powerful application provides a spectrum analyzer and tone generator, along with tunings for many different musical instruments, enabling you to keep your instrument perfectly tuned, using just your Mac. Please try it out (it’s free! ), and remember to keep an eye out for new versions. This is Supernifty’s first foray into Mac application development. Any suggestions are appreciated. There have been a number of updates, improvements and even a new version of Audio Tuner over the last fortnight. A pitch analysis component has been added to simplify the tuning process. This quickly indicates if the note is to too high or too low. The performance of the software has also been improved. An Instrument Tuner for Android has been released. This version of the software can only play the required note, rather than doing the full spectrum analysis. Although not as cool, it is surprisingly easy to use. Hopefully in future Android versions it will possible to implement the spectrum analysis as well. 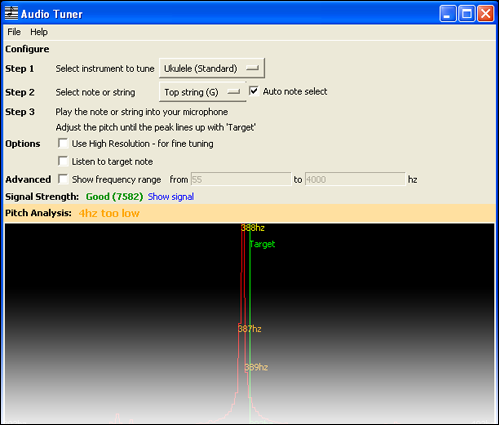 The tone generator functionality has been added to the Windows Mobile Tuner, providing an alternate tuning method – verify the string is tuned correctly by hearing the correct note. Warning: If you are in a meeting (tuning your guitar! ), check your mobile volume before you hit “Hear Note”. A tone generator has been added to the Mobile Java Audio Tuner – hear the correct note on your mobile for verification, as well as getting the spectrum analysis. If your handset doesn’t support the spectrum analysis, you may now be able to use the tone generator to keep your musical instrument in tune! Yeah! A lot of work has been put in to getting the software to work properly on more mobile handsets, with a number of performance improvements, so that the spectrum analysis is more usable on less capable mobiles. If you’ve had problems in the past, this version might be just the ticket. As always, any feedback is appreciated. BlackBerry owners rejoice! Supernifty is pleased to announce the release of Audio Tuner for the BlackBerry. This release brings Supernifty’s super accurate tuning technology to the BlackBerry for the first time. Why buy a tuner, when your BlackBerry can tune your guitar to pitch perfect accuracy? And it’s not just a guitar tuner. You can also tune your autoharp, banjo, bass guitar, cello, mandolin, piano, ukulele and violin. As this is our first release of the software, there may be glitches. If you try out the software, any feedback (good or bad) is appreciated. Further details are available at the main BlackBerry page. Get Audio Tuner for your BlackBerry. I’m pleased to announce the release of version 0.6 of Audio Tuner for Java enabled mobiles. If you have a Java enabled mobile, e.g. Nokia or Sony, or most other recent mobiles, this means you. Now you can tune your guitar wherever you are. And not just guitars. You can also tune your autoharp, banjo, bass guitar, cello, mandolin, piano, ukulele and violin. This version fixes a few annoying issues, such as the exit button not working. And we’ve added an audio signal strength indicator. If you try it out, please provide feedback. Unfortunately, the issue with older Sony mobiles is still present – many of them only provide audio data in the AMR format, which the Supernifty software currently doesn’t support. Anyone with expertise with the AMR audio format, it’s your turn in the sun. Get in touch if you think you can help. We are paying people to test the software on certain cellphone models. If you have one of the models listed, please try it out, and earn some cash in the process. I’m pleased to announce the release of Audio Tuner for Java enabled mobiles, version 0.3. If you have a Java enabled mobile, e.g. Nokia or Sony, or most other recent mobiles, this means you. Now you can tune your musical instrument wherever you are. OK, so this is an alpha release. And unfortunately, Supernifty doesn’t have a Java enabled phone to test against. If you try it out, please provide feedback. Alternatively, if anyone has a mobile they’d like to donate or sell to Supernifty for testing purposes, please get in touch. There are apparently zillions of unused mobiles lying useless in drawers, awaiting such an opportunity. If you like the idea of testing for money, check out Test Army. It’s a new Supernifty project, and it’s nearing beta. There’ll be tests available, and money to be earnt, in the near future. But, in the meantime, try out the new audio tuner, and let Supernifty know if it works. You are currently browsing the archives for the tuner category.